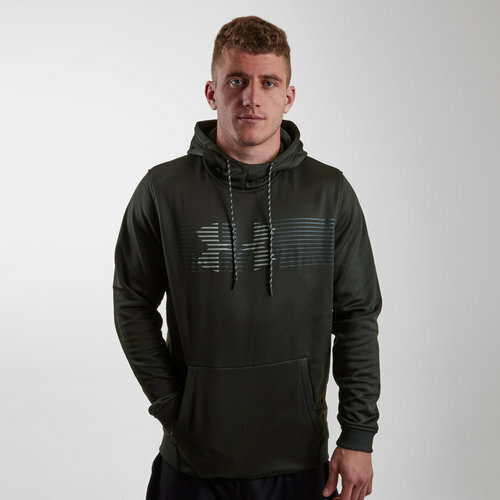 Whether you want to wear it out and about or in training this Under Armour AF Spectrum Hooded Training Sweat in Artillery Green and Moss Green is a perfect choice. This hooded top is UA's original performance replacement for the old-school fleece. It comes in a lightweight material and will keep the wearer incredibly warm with just the right amount of stretchiness to it for superior mobility. It is breathable to allow for ventilation but the soft inner layer traps in heat to keep you warm and comfortable as will the ribbed cuffs and hem. The adjustable hood also comes with an open snorkel neckline so you don't feel trapped while the front kangaroo pocket allows the wearer to keep their valuables safe.